Premiere German performance test magazine Sport Auto sent us this video of the Porsche 911 GT3 RS 4.0 achieving a new braking performance record for road cars. The occasion was the annual Sport Auto high-speed performance 0-300-0 test event for series models in Papenburg, German. The video is a little old (from last month), but we think it's still relevant as it shows the speedo going from 300 km/h (186 mph) to zero in 6.5 seconds - not something you see too often without a crash resulting. To put the achievement into context, the 911 GT3 RS 4.0 beat out the previous world record holder, the Koenigsegg Agera R and its 300 to 0 km/h time of 6.66 seconds. Other competitors in the test included the Bugatti Veyron Super Sport, McLaren MP4-12C, Jaguar XKR-S, Cadillac CTS-V Coupe, Alpina B5 Biturbo, Bentley Continental GT. Limited to just 600 units, the Porsche 911 GT3 RS 4.0 features a naturally-aspirated 4.0-liter engine, the biggest engine ever offered in a Porsche 911, which translates into a hp/liter figure around 125 hp/liter (92 kW) and 368 hp/tonne. That makes for a total output of 500 PS (368 kW / 493 hp) and torque rating of 460 Nm (339 lb-ft). 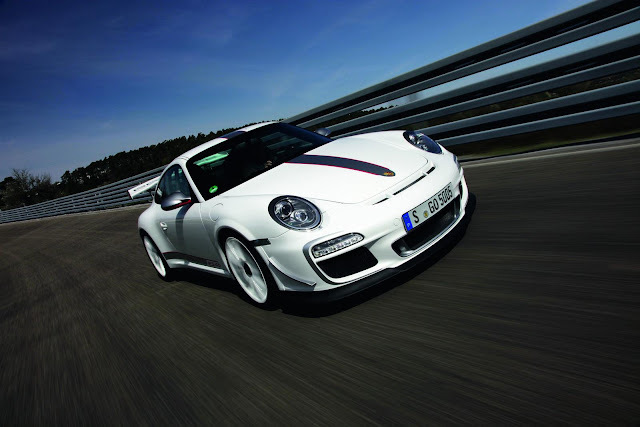 Weighing just 1,360 kilograms (2998 lbs) the car does the 0 to 100 km/h (62 mph) sprint in only 3.6 seconds (c/o Sport Auto) and the GT3 RS 4.0 rounds the Nürburgring-Nordschleife in 7:27 minutes.